During our travels in Southeast Asia, we travelled extensively in Thailand, one of our favourite countries in the world. We particularly loved visiting the popular islands of Koh Lipe and Koh Tao. However, after a while, we were craving a remote island experience, cut off from it all. This is why we choose Koh Tarutao, a remote island, completely untouched and protected by the Thai goverment. Koh Tarutao, a former concentration camp for political prisoners is one of the rare islands in Thailand which are unspoilt and spared from mass tourism. We've put together this comprehensive travel guide to Koh Tarutao to help you uncover the secrets of this beautiful island. 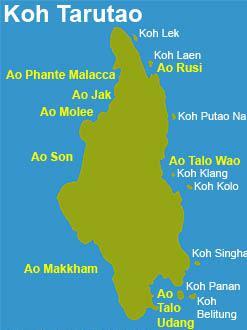 Koh Lipe to Koh Tarutao: you can reach Koh Tarutao from Koh Lipe by speedboat. The journey takes around an hour and cost around $20. You can book your tickets online here. Satun (Pakbara pier) to Koh Tarutao: Pak bara is the closest port in Thailand mainland where you catch a boat to Koh Tarutao. Speedboats take around 30 minutes to reach Koh Tarutao and are quite frequent. You can check fares and timetables here. Krabi to Koh Tarutao: You can get a pickup from Krabi airport or any hotel in town. It is not a quick journet as it includes minivan + ferry. In total, it takes 6 hours to reach Koh Tarutao from Krabi. You can check fares and timetables here. Hat Yai to Koh Tarutao: Hat Yai is the main airport in Southern Thailand and the quickest way to get to Koh Kipe and Koh Tarutao islands from anywhere in Thailand. The journey from Hat Yai airport to Koh Tarutao takes 4 hours. Check fare and timetables here. Ao Phante Malacca is where the boat pier is and where the national park headquarters are. This is the area where more people stay, as it has a few bungalows, spaces for tents, a decent restaurant and clean bathrooms and toilets. Ao Molee also has some bungalows but is not so popular as a place to stay. Ao Son is where you will find the best beach on the island. Koh Tarutao is the largest island in the Tarutao National Maritime Park. To keep this island protected and untouched, the Thai government requires visitors to pay a small entrance fee which helps them protecting the island and maintening the facilities. The entrance fee to Koh Tarutao costs 200 bahts (£4/$6) and is valid for 5 days across all the Tarutao National Marine Park islands. Pro tip: if you have a student card, you pay the half price “children's fee”. You can either rent a bungalow or a tent space. We stayed in one of the bungalows huts for 2 nights at Ao phante Malacca, which costs 600 bahts (£12/$18). You can also rent a tent for 200 bahts (£4/$6) a night. They come with mats and mosquito nets. If you have all the equipement with you, you can pitch your own tent for 30 bahts a day. To book accommodation in advance you can do it online or call the National Park on: 074783597 or 074783485. There is a really nice restaurant at Ao Talo Phante Malacca and an even better one at Ao San, around 6km from the headquarters. The camping areas at Ao Talo Phante, Ao San and Ao Molee each have clean public bathrooms with shower facilities. There is no electricity from 6:00 to 18:00 everyday. There are many beautiful and remote beaches on Koh Tarutao. Our favourite was the beach at Ao Son. Although it's far from the bungalows/camping ground area at Ao Talo Phante Malacca, it's definitely worth the journey, and you'll most likely have it all to yourself. The sunsets here are stunning and the water is everything you dream. 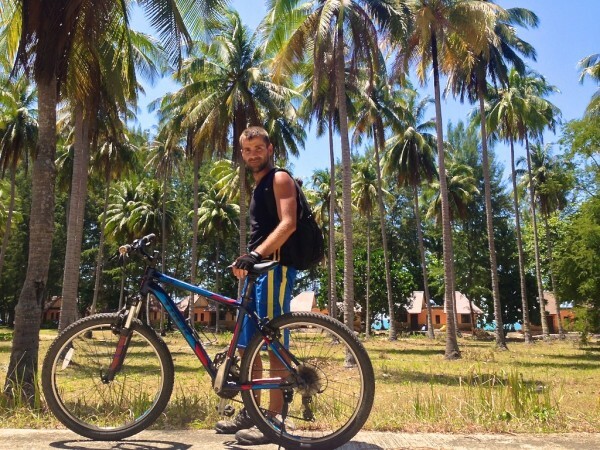 You can rent excellent sturdy mountain bikes for 250 bahts (£5/$8) for 1 day and go from Ao Talo Phante Malacca to the more remote and pretty Ao Son, around 6km away. The trail goes through the Tarutao mainland jungle and took us around 40 minutes each way, which included a few stopovers for photos. There are some excellent trails on Koh Tarutao, which take you through the vast thick jungle inland. The most famous is the trek to the Lu Du Waterfall near Ao Son as well as the hike up to the 400m Tob-Bob cliff at Ao Talo Phante Malacca. 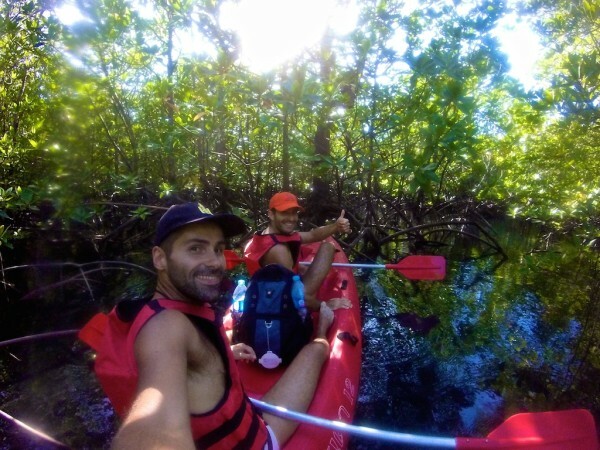 Our favourite activity on Koh Tarutao was renting a kayak and paddling through a mangrove forest to a crocodile cave towards Ao Rusi in the northeast side of the island. This is a really fun day trip, a work out, gorgeous natural environments and a unique cave experience all in one. Just remember to bring head torches for the dark crocodile cave! We rented paddle boats from the National Park head office, which cost 500 bahts (£10/$15) for the whole day. For more inspiration planning your trip, check out this awesome 3 weeks Thailand itinerary. 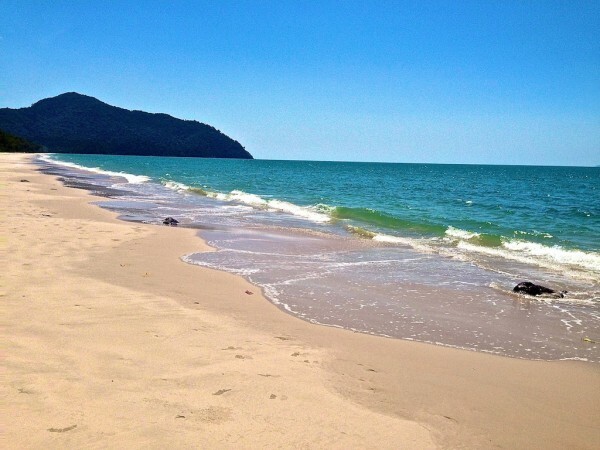 Why not you choose Koh Lanta? The most common way to get to Koh Lanta is by boarding a ferry from nearby islands. And I personally know a ferry service who offer quality services and their ferries are well maintained to ensure safety. Hi, do you know if its possible to get to koh Adang straight from Pakpara? I’ve only got one weekend, so I need to choose between the 2. However, most info i see regarding transport to Adang is from Lipe. We’re so glad you’re going there. In our opinion, these are the most beautiful islands in Thailand. 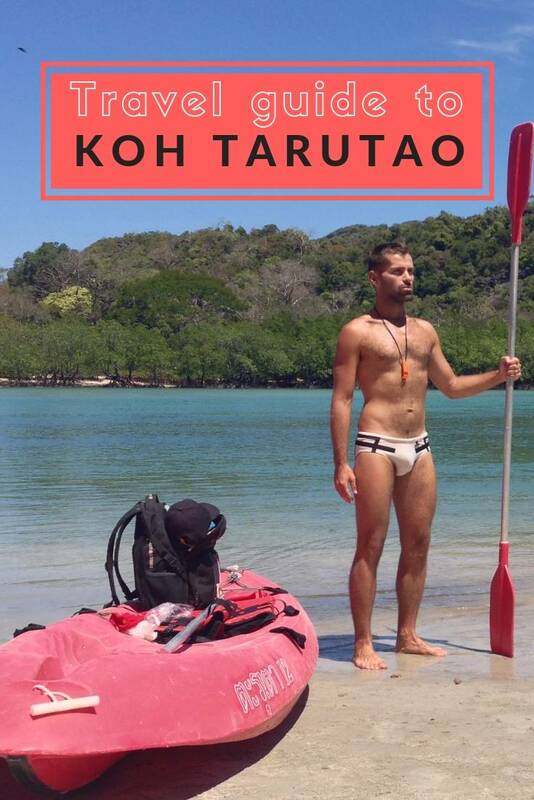 Koh Tarutao is more of an adventure island, where you go for kayaking, trekking, biking, snorkelling etc but it is not so much of a beach destination. Koh lipe (make sure you stay on sunrise beach) and Koh Adang have the most beautiful beaches. We think 6 nights is great to explore those 3 islands. And Koh Tarutao is kind of mid way between Koh lipe and the mainland so it makes an easy overnight stop. Enjoy your time there, it will be unforgettable! Thank you so much for your quick answear, it really help me with my itinerary, now i know i make good decisions 🙂 Best wishes! Early helpful guide both, and came in great time, heading to koh lipe tomorrow morning, looking forward to following in your footsteps! Is there a decent place to stay at tarotao? is there atm’s there? It’s quite basic but the huts are decent enough, lots of space and comfortable beds. No ATMs on Tarutao when we were there.